Welcome to MA1 Catalogue Gallery! View our whole range of products. Welcome to MA1 Catalogue Gallery. Here you will find an interactive catalogue of our products. Browse through this page and find out the best product that fits your needs. If you would like to view our whole range of strength equipment, go ahead and click the MA1 Strength Catalogue. If you are a commercial gym looking for premium grade commercial gym equipment, please click on our MA1 Elite Catalogue to review MA1 Elite Series gym equipment. Looking to do some rehab and recovery? 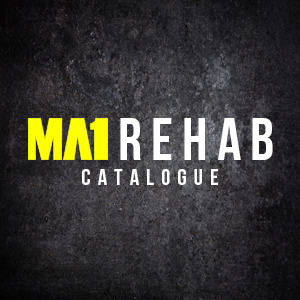 Click through our MA1 Rehab Catalogue and review our rehabilitation fitness equipment. MA1 carry a full range of commercial fitness equipment like Pro Grade Kettlebells, Rubber Hex Dumbbells, Bumper Plates, Slam Balls, and so much more. If you are searching for durable combat sports gear and high-quality fitness clothing, take a look at MA1 Clubwear Catalogue and MA1 Apparel Catalogue. We make sure to provide everything you need. Contact us today to know more about our products.